Mopeds have become an increasingly popular option for commuters, especially in light of rising gas prices. Unfortunately, the use of a moped can be extremely dangerous. In fact, ABC 10 reported that moped drivers are around 35 times more likely to die when involved in a moped accident than when involved in a car crash. Our Boston injury lawyers know that avoiding moped accidents requires a joint effort between drivers of passenger cars and moped riders. Motorists in passenger vehicles need to be aware that there may be moped riders on the road and understand the rules while moped riders also need to follow the laws, be vigilant when riding and exercise care to prevent injury. The state of Massachusetts defines mopeds as “motorized bicycles” that have a maximum speed of 30 miles-per-hour or less, that have an automatic transmission and that have cylinders of 50 cc or less. Riders of mopeds in Boston are required to register their mopeds and as Boston.com reported, changes to state law that went into effect on January 1, 2011 mandated that owners of mopeds are required to have license plates and insurance on their vehicles. Mopeds must have a sticker issued by the RMV and affixed to the vehicle and drivers of mopeds are expected to comply with all laws in the commonwealth. Moped riders must obey traffic laws. Mopeds can use bicycle lanes on roads but not off-street recreational paths. Mopeds can use all public roadways in the state except express state highways or limited access areas where signs have been posted prohibiting bicycles. 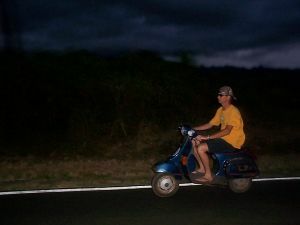 Moped riders must be at least 16-years-old and must have a valid license or permit. Moped riders need to use hand signals before turning or before stopping. Mopes can keep right when passing a passenger vehicle that is in the road’s travel lane. Mopeds cannot be operated at a speed exceeding 25 miles per hour. Moped riders and passengers need to wear a standard helmet approved by the DOT. Motorists in passenger cars are advised to be aware of the risk of a moped coming into their blind spot. Hopefully if moped riders and drivers all do their part to make the streets of Boston safe for moped riders, the high fatality rate should begin to decline and people will more safely be able to embrace this method of commuting. If you have been injured in a car accident in the Boston area, contact Jeffrey S. Glassman for a free and confidential appointment to discuss your rights. Call 1-877-617-5333.